“Andrew and Zelda date for eight months, three weeks, five days, and one hour. This show is the comprehensive account of their relationship, from A to Z.” Okay, right away this is very intriguing. What happens after eight months, three weeks, five days, and one hour? Do they break up? Do they get married? Does someone DIE (Cough cough, “How I Met Your Mother”)? This episode picks up where the last one left off, the morning after their first date. Andrew and Zelda spent all night “talking” and are shown making out in front of their respective work buildings. The end credits of ‘This Week In Baseball’- Andrew’s “big glory music”- have been playing in his head ever since he met Zelda. Zelda, unsurprisingly, doesn’t have big glory music of her own, on account of how she is jaded about life and skeptical of love and happiness, but even she is feeling good today. 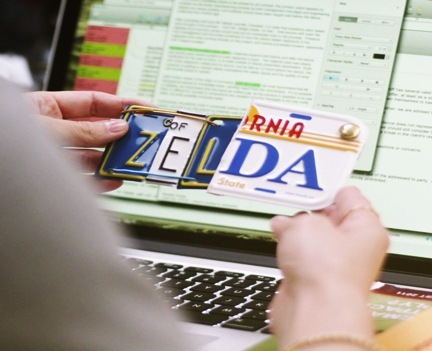 The other night, Andrew and Zelda passed one of those racks that sell personalized license plates. Zelda complained about how they never have her name, and when Andrew wasn’t looking she bought one that says “ANDY” (they were all out of Andrew.) Zelda is clearly besotted with Andrew, and, of course, Andrew is equally smitten with Zelda. In the meantime, Andrew’s company is beta testing a new dating app. It’s a lot like tinder, except instead of “swiping” someone, you “tap” them. Although the head of HR (Ben Falcone!!) warns their boss that this is probably not a good idea, she has the employees test it out on one another. Andrew suddenly remembers that he’s supposed to go on a date with Brooke from marketing that night! Oops. He calls Zelda to tell her about the date, and Zelda tells Andrew that it’s fine. In fact, she also has a dinner date that night, so no worries. She didn’t have a dinner date, but what else is a girl supposed to do? To keep up appearances, Zelda asks out “Vanity Rep Mike” from her office (vanity reps are apparently that thing where guys do pushups and stuff before a business meeting in order to look pumped?) even though she is not attracted to him AT ALL. Andrew’s friend Stu and Zelda’s friend Stephie both do recon on the others’ dates, while Andrew and Zelda try (and fail) not to go crazy. While on his date with Brooke, Andrew tracks Zelda’s movements on a traffic app he downloaded the other day (very creepy to be honest). Stu follows Zelda on her date, and reassures Andrew that the date is a bust. In true rom com fashion, Andrew rushes over to Zelda’s apartment to see her, only to have Vanity Rep Mike answer the door… shirtless! Nothing happened between Zelda and Mike; he had just done so many pushups against her kitchen door that he sweated through his Oxford shirt. Classic Mike. That night, Andrew’s boss calls Dinesh, a programmer for the new app. She insists that something is wrong with it, as she hasn’t gotten a single tap! Dinesh reluctantly ‘taps’ her in order to prove that the app does actually work. EEEEK! Things are moving too fast for Zelda, who awkwardly thanks him, and both parties leave uncomfortable once again. Lydia (Dinesh’s boss) calls him into her office in order to address his “tap.” She tells him that things could never work out between the two of them, but not to give up! “There’s nothing sadder than unrequited love, right Howard?” Lydia says to the HR guy. He agrees with her, and then whispers ‘” love you” when her back is turned. So true, Lydia, so true. Back at her office, Zelda finds a package that Andrew sent her days ago. Inside is a personalized ZELDA license plate that Andrew had made from a bunch of other personalized license plates. Zelda goes to Andrew’s office to tell him that she loves it (duh!) and wants to be exclusive. Andrew feels the same, and Zelda leaves his office with her own big glory song playing in her head. Atta girl. 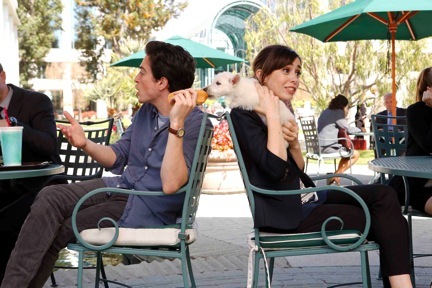 This show is adorable and charming and I fell in love with it as quickly as Andrew and Zelda fell for each other! I love how both characters are three-dimensional and dynamic on their own, seeming to exist beyond the sole purpose of getting together and falling in love (for eight months, three weeks, five days, and one hour).